This creative writing lesson plan is broken into topic sections. Each section includes a short lecture with questions to ask the class along the way, along with a few follow-up activities. Characters are the heart of any story. 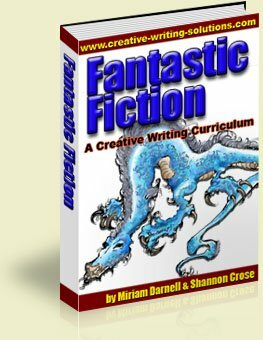 Many writers start with an idea for a character and then ask "What if" questions to build a story around them. Characters can usually be broken into three categories. The protagonists (good guys); the antagonists, the people who stir up all the trouble in the story (bad guys); and finally, the minor characters, the ones who help move the story along, but who are less developed than the main characters. You, as the writer, want to find out as much about these people as you can, even the minor ones. DISCUSSION: Have students name some of their favorite protagonists and antagonists and elaborate on what made them interesting characters. Characters come from all sorts of places. People you know, people you read about or see on TV. The mother in your story may be based on your mom. You may base your main character on yourself. All those things are okay. In fact, when you first start writing, the best place to find characters is in the people around you. Just keep in mind that your imagination has to fill in the holes. Say one of your characters is based on your best friend. In your story, you have that character come under attack by a dragon. Chances are, if your real best friend saw a dragon hovering above his house, he'd freak out. I know I would. But the character, who is based on your friend, might have to be a bit braver than that in order for the story to work. You have to use your imagination and try to figure out what your character would do given each unique situation. Would he run? Would he stay and fight? You can use the people around you for your stories, but at some point those characters are going to act differently from the people in your real life, and that's okay. In fact, you want that. Your characters will start to take on a life of their own. Have each student fill out an Advanced Character Sheet (included in the eBook, this one is four pages, not the one listed on our worksheet page). This activity will take them a full hour or more. When they are done, they can fill out a pet or residence sheet. Have each student write a "lifeline" for the character, outlining all of the major events that happen to this character during his/her lifetime (no complete sentences required! ), even if most of the events won't be used in the story. This activity gives students the realization that they are truly in control of their own characters – a chance to play god. They can look down upon their characters and have a plan for each one – how they're born, how they live, and how they're going to eventually die. Remind them that they don't have to mention the lifeline events in the story that they’re working on. But it shows that each character has more substance (i.e. a past and a future) than what might be displayed in the story itself. Have students imagine that someone is planning to make a movie out of their stories. They get to choose the actors who would best play their characters in this movie. Students must look on the internet or in magazines for pictures of people who could play their characters in this movie. Having a picture of someone real does wonders in terms of bringing characters to full life. They can also take photographs of real people to use as their characters. From this time forth, they should have the pictures of their characters in front of them whenever they are writing their stories.